← General election 2015: who and how many will vote? 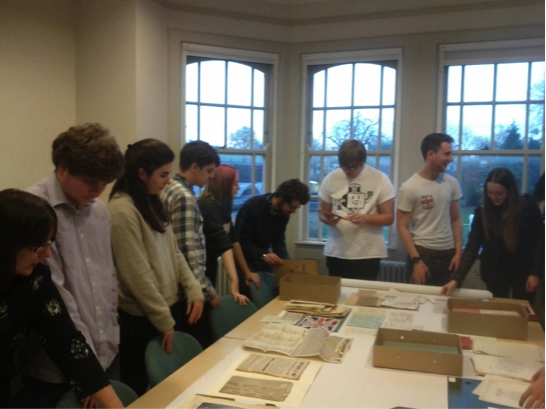 As part of our Period in Modern History module, Elections and Political change in Britain, 1832-1945 a trip to Special Collections at the Museum of English Rural Life was organised by Dr Jason Parry. The aim of the session was to explore how parties communicated with people across a period of considerable change, in the face of an expanding electorate as well as technological and cultural developments. We began the session with a lecture which charted these changes, covering the rise of the election meeting, electoral practice after the 1872 Ballot Act which for the first time introduced secret voting in Britain, and the populist Edwardian period which saw politicians and parties distribute millions of posters and pamphlets. Our trip to the archive provided us with an opportunity to handle these leaflets, pamphlets, speeches and letters first hand. 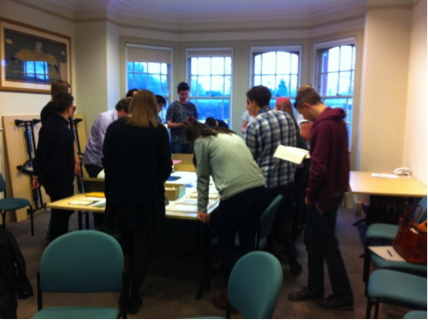 The material held at Special Collections was directly relevant to the course and helped increase my understanding of the topic. 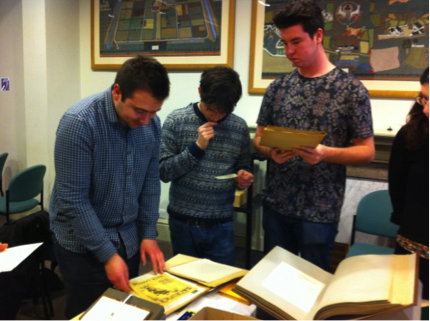 Special Collections is home to significant collection of primary sources from a wide range of topics and periods which are maintained and organised by a very welcoming team. Upon arriving we were taken through the recently renovated, modern section of the museum before we were ushered into a classroom where we were given a helpful talk by one of the archivists on how to use the books respectfully as well as information on their collections. Before we began examining the materials, Jason gave us an enthused talk on political communication before we headed over to a large table on which staff had dug out a large amount of resources on the topic at our request. Much of the source material we consulted was from the Astor collection. Waldorf Astor was MP for Plymouth Sutton and collected a vast amount of election material for each of his contests. His wife, Nancy Astor, who was the first woman to take a parliamentary seat in 1919 (also Plymouth Sutton) continued this excellent record keeping. Her own papers contain material from all the interwar elections with folders organised by election and party. The source materials for our particular topic dated mainly from the first half of the twentieth century, which was unsurprising because the mass production of party propaganda began at this time. 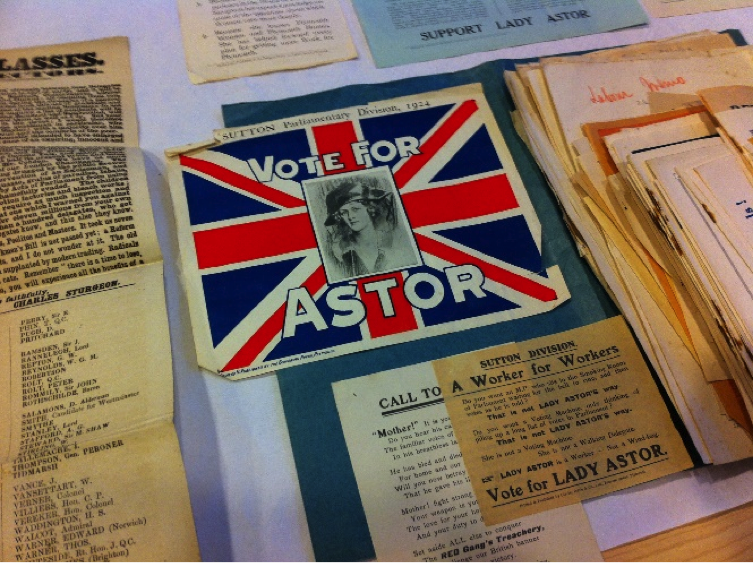 The documents included letters of invitation to attend party gatherings and events, leaflets, hand-outs and posters promoting party or party candidates such as Lady Astor, one of which is pictured below and makes use of the Union Jack to emphasis patriotism. One common characteristic of much of this propaganda was the use of strong, emotive headlines which incorporated fearful or hopeful words in order to catch audiences’ attention and provoke an immediate reaction. Many of the leaflets we looked at were dedicated to sabotaging opposition parties and discrediting their policies or their claims to being a political party altogether. 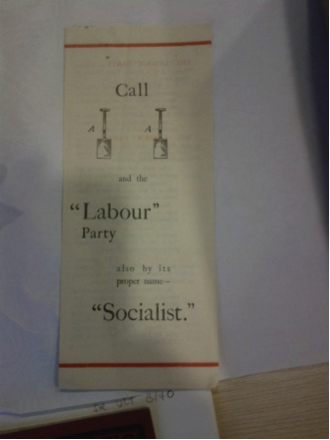 Leaflets such as this Conservative leaflet, which calls the Labour Party a Socialist Party, really brought to life for me the reasons underpinning the interwar dominance of the Conservatives because of their ability to discredit their opposition through effective use of propaganda. The wide-ranging material available at the archive is an excellent resource for students to utilise, in particular those in the penultimate year of their studies, who I’m sure will now be beginning to think about or their dissertation topics as I am. This is ideal considering that Special Collections is just a ten minute walk from the Whiteknights campus. Overall the trip gave me an insight into the topic and a learning experience that was unique and very interesting, for which I would like to thank both Jason and the Special Collections team for. This entry was posted in Students Page and tagged Britain, elections, politics. Bookmark the permalink.